The outer district police has arrested a contract killer allegedly involved in two murders and 12 robberies. The accused had been identified as Rakesh (24), the second-in-command of an infamous interstate gang of dacoits and murderers called Kala-Raka, said the police. It added that he had opened fire at them during his apprehension. The Delhi High Court has dismissed a plea by a private firm owner and its accountant, challenging a lower court's decision to put them on trial for driving one of their employees to commit suicide a decade ago for moving a labour court against them. Angry with his friend for attempting to molest his wife, a 23-year-old man allegedly killed him and disfigured the body to hide his identity. However, his crime could not remain hidden, as not only did the police reach his house by tracing blood stains, but also saw him with the body in the footage of a CCTV camera installed outside the shop of a jeweller in the area. In a case of road rage, a man was allegedly stabbed when he rammed his car into the rear of a bike driven by a juvenile, last night at Janakpuri. The south-east district police has arrested four youths in connection with the murder of their friend who was shot at on October 23 in the Jamia Nagar area. He died three days later. Heavy metal band Metallica's first ever concert in India here was today postponed for a day, organisers said, leading to angry fans going on the rampage and the police launching an inquiry into the incident. The family of a transporter was allegedly made captive, beaten and robbed of valuables worth Rs 4.5 lakh by a gang of over a dozen bandits at Sector 12 in Noida on Wednesday. The criminals fled with Rs 3.25 lakh and jewellery worth Rs 1.25 lakh in the family's car. Delhi revenue minister AK Walia today underlined the importance of security for the devotees of Chhat Puja who will gather at various ghats on the banks of the Yamuna to offer prayers. Three men booked for stealing books from the library of an MCD school in 1999 and selling them to a scrap dealer have been acquitted by a Delhi court on doubts that they were implicated in the case. Delhiites today celebrated Bhai Dooj, with sisters applying vermillion on their brothers' forehead to ward off evil. Coming as it does two days after Divali, Bhai Dooj tradition calls for sisters to visit their brothers' house for puja. In return, brothers bestow gifts upon their sisters. The Delhi government has decided to launch Chacha Nehru Sehat Yojana, a health scheme for the schoolchildren, on the birth anniversary of the first Prime Minister of India, Pt Jawaharlal Nehru. The announcement about the scheme was made by Chief Minister Sheila Dikshit in her budget speech for 2011-2012. India's child rights panel has asked the Delhi government to probe and report to it on a complaint that Bharatiya Janata Party (BJP) leaders had been distributing uniforms and satchels to students of schools run by the MCD. Investors and builders of Noida Extension are likely to meet on November 6. Three coaches, including a luggage van, of the Kalka-Howrah Mail derailed early today near Narela station in Delhi, said a railways official. No casualty was reported in the incident. BS Jaiswal, deputy commissioner of police, outer district, said a reward of Rs 20,000 was declared for his arrest by the Delhi police. "With his arrest, we have solved two brutal murder cases and 12 cases of carjacking, robbery and attempt to murder. A motor cycle stolen from Shahbad Dairy was confiscated from him. We also recovered a pistol with four live cartridges and two used cartridges of the bullets fired at the police team during the arrest," said the DCP. On April 1 at 7.30 am, the police was informed about a person who was shot at in a field opposite Chotu Ram Institute at Kanjhawala, Delhi. The injured person, Sonu (27), disclosed to the police that he was shot at by Rakesh. Later, Sonu succumbed to his wounds. On September 5, Rakesh with his accomplice Naresh Sethi allegedly shot dead Arun, added the DCP. The police learnt that Rakesh had joined a gang consisting of Sunil, a parole jumper of Karnal Jail; Anil, who is wanted in numerous murder cases in Haryana; Sandeep and some other persons with criminal backgrounds. The gang was headed by Sandeep and Rakesh was the second-in-command. 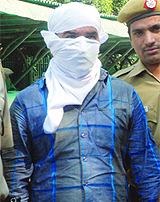 The DCP said the police raided hideouts of Rakesh and his accomplices in Delhi, Uttar Pradesh and Haryana. "On October 26, around 6 pm, we received information about the presence of the accused persons in Kanjhawala. Around 7.30 pm, Rakesh was coming from the Ghewra Fatak side on a motor cycle, the police team signaled him to stop. Rakesh tried to flee, but his motor cycle lost balance and he fell down. He stood up, took out a pistol and fired two rounds at the police team. However, he was apprehended. We have launched a manhunt to nab his accomplices," said the DCP. 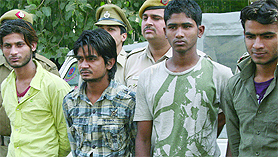 During interrogation, Rakesh confessed to have murdered Sonu and Arun. The police said that he did it for revenge. According to the DCP, Rakesh disclosed that he had committed numerous car-jacking and robberies in Delhi, Haryana and Maharashtra. He did it with his accomplices-- Naresh, Anil, Sunil, Sandeep, Vinod, Surender and Neetu. On February 4, Rakesh and his partners robbed a Ritz car at gun-point in Sonipat, Haryana. The car was then used to rob two trucks filled with rice bags at Rewari, Haryana. Since then the gang has been committing robberies. Justice Mukta Gupta dismissed the pleas of Vee Kay Traders' owner Vijay Sakhija and its accountant Uttam Duggal, saying they did not only abuse and humiliate victim Sanjay Srivastava, but even threatened him with dire consequences. "There is a prima facie case raising a strong suspicion of petitioners having committed the offence under Section 306 (abetment of suicide) of the Indian Penal Code. I find no reason to interfere with the impugned order," said Justice Gupta, dismissing the duo's appeal against the April 2007 order of a trial court. Sakhija and Duggal had gone to the high court, challenging the trial court's order to frame charges of abetment to suicide against them for driving their employee Srivastava, a Lucknow native, to take the drastic step. The lower court had ordered the duo's trial on the basis of a suicide note written by Srivastava, who had taken the drastic step on February 7, 2001, two days after having been scolded, abused and humiliated by his employers. In his suicide note, Srivastava had said a case was filed in the labour court against his employers at a time when he was at his native place. After his return from Lucknow, Srivastava had said in his suicide note, addressed to the in-charge of the local police station, that he was summoned by his employers, held responsible for filing of the case and was badly scolded and humiliated by them for it. They even threatened him with dismissal and dire consequences and made him sign several blank papers, putting him under huge duress with regard to the future of his children and his own safety, Srivastava had said in his note, while specifically naming Sakhija and Duggal for the drastic step he was to take. According to Anil Kumar Ojha, DCP (south-west), the accused has been identified as Vivekanand, a resident of Sagarpur. Victim Prabhas Kumar, who lived in the same building as Vivekanand, was discovered dead on the morning of October 21. "We had identified the accused soon after the murder, but he was absconding. A police team went to his house in Bihar, but could not find him. He was arrested yesterday when he came to his sister's house at Kailashpuri in the Sagarpur area," said Ojha. He said that Vivekanand had confessed to the crime and revealed that he killed Prabhas for trying to molest his wife. According to Ojha, Kumar and Vivekanand hail from Bihar. In fact, Vivekanand had called Prabhas from his village to help him in his work of flooring houses. Initially, the duo stayed together in a rented room in Indira Park, but after Vivekanand's wife came to stay with him, Prabhas shifted to another room in the same building. "Initially, all was well between the friends. But soon Prabhas started working independently. Later, Vivekanand's wife alleged that Prabhas had teased her and even tried to molest her. This infuriated Vivekanand. On the night of October 21, after an altercation, Vivekanand killed Prabhas with a cutter and dumped his body in a nearby nullah," said Ojha. He added that the victim's face and private parts were destroyed by the accused. During investigation, some residents of the area informed the police that blood was found spilled near Vivekanand's house, which is 150 yards from the nullah where the body was found. The police team went to the house, but found it locked. When the door of the house was opened, a blood-stained T-shirt, blanket and karni (a house-building tool) were found in the room. "On further search of the adjoining areas, a CCTV camera was found installed on the same street outside the shop of a jeweller. The police requested the owner of the jewellery shop to show it the CCTV camera footage. On scanning the footage, it found that on October 21 at 2.57 am, Vivekanand was seen carrying Prabhas' body on his shoulder," revealed Ojha. The police identified the victim as Varun Oberoi, who was travelling with his family in a car. The assault happened following an altercation between Varun and the minor and his friends. According to the west district police, after Varun's car hit the motor cycle, the juvenile, a class X student, got infuriated and called the owners of the vehicle, Vikrant Singh and Dinesh (22). After reaching the spot, the three started quarrelling with Varun. The quarrel turned ugly when Vikrant allegedly stabbed Varun. The accused then fled the spot. "Varun was traveling with his wife and children in a car. While trying to overtake the juvenile's bike, he rammed his car into it. This led to a heated argument between the two parties. One of the three accused then stabbed Varun in the stomach with a knife. He was admitted to Mata Sundri Hospital, where his condition is stable," added the official. Sources said that Varun had sustained injuries in the shoulders and chest. The incident took place around 11.30 pm, according to the sources. When the police reached the spot, Varun was sitting in the car with his family and was grievously injured, according to sources. The family members told the police that Varun had accidentally hit the motor cycle. A case of attempt to murder has been registered against the accused. The police has arrested Dinesh and the juvenile. However, Vikrant is absconding. According to sources, Varun is a resident of Mumbai and works in a BPO there. He had come at Delhi to celebrate Divali with his in-laws who stay in Tilak Nagar. According to the police, Naushad (21), a resident of Abul Fazal Enclave, was shot at on the right side of his face and admitted to Holy Family Hospital where he succumbed to his injuries three days later. According to Ajay Chaudhary, additional CP, south-east, there was no eyewitness in the case and Naushad could not give a statement to the police owing to his serious condition. However, the police recovered a motor cycle from the spot where the incident took place. The bike led the police to the accused. "A motor cycle was found abandoned at the spot of the crime. The vehicle was registered in the name of Aziz-ur-Rehman, who revealed that it was being used by his son Fazal-ur-Rehman and that he was presently not in the house. The police also learnt that Fazal's friends were all absconding since the incident," said Chaudhary. This made the police suspicious and efforts were made to trace them. Fazal and his friends Salman, Masroor and Chand were apprehended after several raids. Their interrogation revealed that the shooting was the result of a minor altercation between the accused and Naushad. "During the altercation, Naushad reportedly slapped Salman, following which Fazal fired at Naushad from a countrymade gun. The bullet hit Naushad on the right side of the face. After the incident, the accused fled the spot," revealed Chaudhary. He added that Fazal has admitted to have hidden the weapon of offence in east Delhi where his father has a scrap godown. A number of over-enthusiastic admirers of American heavy metal band Metallica gate-crashed into the event venue, forcing the organisers to postpone the concert. The eagerly awaited musical extravaganza, scheduled to be held at Leisure Valley grounds here this evening, will now be held at 4 pm on Saturday. The gatecrashers also ransacked the venue, damaged several stalls put up for the event and climbed up the stage prepared for the event. The concert was scheduled to start at 7.30 pm. However, the excited fans of the band started gathering at the venue quite earlier in the day. They included a number of youngsters from Delhi and other parts of the NCR. Eventually, after the event was postponed, the fans returned disappointed. "The concert has been postponed till Saturday due to technical hassles," the organisers, DNA Networks, told reporters. With a 20,000-strong crowd at the Leisure Valley venue here, disappointed fans became aggressive, a police officer said. People hurled abuses and threw water bottles at security guards on stage. An LeD wall was damaged as fans threw chairs at it, he said. Fans from Kerala, Malaysia, Singapore, Indonesia, China and Nepal, among others, felt "robbed of their money". Deputy commissioner P.C. Meena said: "The organisers did not inform about the cancellation of the programme. The local administration will take legal action against them. An inquiry has been started." The transporter, Parbhal Singh, who hails from Dallupur village in Delhi, lives with his wife Rajbala, sons Kamal and Mohit and a daughter in the B-block of the sector. On Wednesday, around 2 am, over a dozen armed criminals barged into Singh's house after scaling the boundary wall. They snatched the mobile phones of the house members, thrashed them and locked them up in different rooms. Then, they opened the almirahs and took away Rs 3.25 lakh in cash and valuables, including jewellery, worth Rs 1.25 lakh. The robbers also took along Singh's Swift D'zire car. But after a short distance, the car collided with a truck and the bandits then sped away in their own Scorpio car. On raising the alarm, the family was later freed by a guard. Singh alleged that the attitude of the police was very unhelpful. However, SP (city) Anant Dev said it was not a case of dacoity, but theft, and the police was taking steps to apprehend the accused. "It is our duty to provide them with a safe environment for the puja. The city government will complete all arrangements by October 30," said the revenue minister at a meeting called today to review the preparations. The meeting was attended by chairman (DKVIB) Veer Singh Dhingan, chairman (Tirath Yatra Vikas Samiti) Gajbhan Mukut Sharma, additional secretary (revenue) Kuldeep Singh Ganger, all deputy commissioners (revenue) concerned, SDMs, director (health services) and senior officers from the MCD, DJB and DUSIB. The Delhi police has been requested to install CCTV cameras at the ghats and deploy adequate number of personnel to avoid any untoward incident. The power distribution companies have been told to ensure proper streetlighting at the ghats. Walia has instructed the officers concerned to ensure completion of all arrangements, including water supply, sanitation, adequate water in the ghats, deployment of ambulances and medical facilities. "The plea of accused that they were implicated seemed to be probable," said metropolitan magistrate Prashant Sharma, while letting off Jasbir Singh, Dev Prakash and Krishan Prasad, facing trial for allegedly stealing books from a primary school at RK Puram. According to the prosecution, headmistress Kamlesh Sharma found an almirah in the library broken open on April 15, 1999 with some books missing. A month later, the books were found at scrap dealer Krishan's shop in the neighbourhood market by the school's watchman. The police arrested Krishan, who said he had purchased the books from Jasbir and Dev. The duo, in turn, said they had received the books from two men named Ram Gopal and Deepak. During the trial, the court doubted the prosecution version that the books were traced by the school watchman. "I cannot expect a chowkidar to know the identities of the books present in the library. Reason being, his job was to safeguard the premises and not to look after the books," the magistrate said. Women in ethnic wear were seen in Metro coaches, aboard city buses and on vehicles on Delhi roads, carrying huge packets of gifts. "The sentiments of the festival are like Rakhi, but they are different in a way. On Rakhi, the brother promises to protect the sister, but on Bhai Dooj, sister applies 'tika' on the brother's forehead for his good luck and protection," says Sunita Chaudhary, a resident of Delhi. There are several stories behind the origin of this festival. One popular belief says Yamaraj, the god of death, went to visit his sister at her house and she welcomed him by putting an auspicious mark on his forehead for his welfare. Another one says Lord Krishna, after killing Narkasur, went to meet his sister Subhadra. She welcomed him with a vermillion 'tika', which started the tradition. In the Capital, rides on Delhi Transport Corporation (DTC) buses were free for women from 8 am to 5 pm for the festival and the Metro made some 200 extra trips during the peak hours. "Good gesture by Ronit Roy that he took the injured to hospital," joint commissioner of police (traffic) Satyendra Garg posted on the Facebook page of the force that has more than 85,000 followers. However, he advocated the need for responsible driving, especially by celebrities. "Celebrities are to be real icons in responsible driving," Garg added. Roy (42) was arrested on Thursday after his speeding Mercedes rammed into a car, injuring three of its four occupants, including a woman who is in a critical condition. A court later granted him bail. The incident occurred on Link Road near Amboli in the Andheri West suburb around 6.30 am. The other car was thrown off the road and overturned. However, there were some who disagreed with Garg and accused Roy of drunken driving and flouting the rules as he was overspeeding. "Driving at a speed of above 100 km in early morning, that too after Divali revelry, does indicate drunk driving. What kind of a responsibility is this," Sameer Bahadur contended. The decision regarding the launch of the scheme had been taken at a meeting presided over by the Chief Minister. It was attended by health minister AK Walia, chief secretary PK Tripathi, principal secretary (health) Anshu Prakash, principal secretary (finance) DM Sapolia and director, health services NV Kamath. Dikshit has instructed the health and the education departments to work in tandem to put the scheme on the right track. She instructed the health department to ensure that the proposed health check-ups should be comprehensive and take care of intervals between immunisations. Initially, the scheme will be launched in over 100 schools. Later, it will be introduced phase-wise in all 954 Delhi government schools and will be closely monitored to prepare a comprehensive health profile of the children. "The complaint is self-explanatory which may kindly be perused," said National Commission for Protection of Child Rights member secretary Lov Verma while issuing a notice to Delhi chief secretary PK Tripathi. "The commission has taken cognizance of the matter and directed that the matter be referred to you (Tripathi) for investigation and report to the commission," said Verma on a compliant filed by an advocate, Ashok Agarwal. The president of the Noida Extension Flat Owners Association, Abheshak Kumar, said the office-bearers had discussed the matter with the builders and a meeting had been fixed for November 6. The association had earlier held a meeting on October 23. At the meet, the investors had decided to seek three assurances in writing from the builders-- not to put extra financial burden on the investors, not to increase the floor area ratio (FAR) and not to build additional towers on the vacant ground. A dozen trains were diverted on this line after the derailment at 5.43 am. 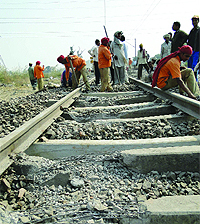 "The blocked line on Delhi-Ambala section of Delhi division was restored by 1.30 pm and the other line (down line) is expected to be cleared by later today," added the official. Another dengue death was reported from Delhi today, raising the toll to five.